We miss our little boy Ciélo. I can see that Moët is looking around for him. Unfortunately it is not unusual that some puppies don't make it the first week, since they are very small and fragile and can't regulate their body temperature that stays quite low. But we had not expected such a loss and it is hard to bear. We try to stay positive and enjoy his sisters and brothers and give them all the love and care we can offer. 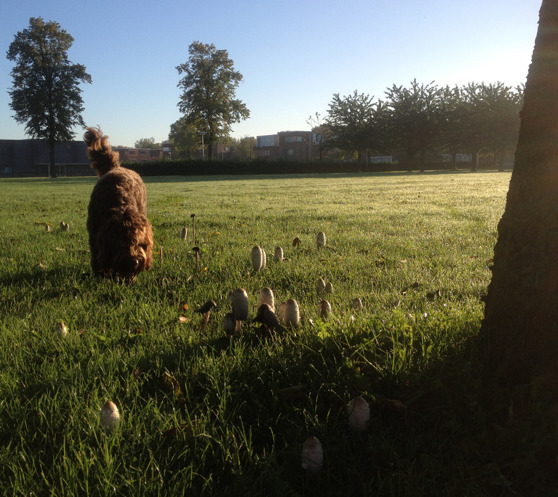 Today was the first day that Moët showed that she wanted to take a longer walk in the morning. Til now we made short rounds and she has clearly turned around to show that she wants to go home to her babies. While at the same time respecting her urge to be with the puppies, it is also important that you don't wait too long with starting taking longer walks again after the ddelivery, to build up her condition again. She has some heavy tasks waiting for her to feed all these hungry mouths.